As I’ve referenced in a past post we’ve hit a sad stage in the offseason. But now, not only is football over, even the NBA season is finishing up. The dark days ahead can only be pacified by one thing: wild, wild debate. I’ve already talked about the possibility of a new jersey. Let’s take that a little further. Gather here, one and all, to take part in this coarse ritual. The theme for this trifling affair is the iconic USC uniform—a source of constant debate. “Stick with tradition and change nothing. Don’t follow the Oregon fad,” some will say. The whisperings from the west spoke of helmet changes once before. Hark! The harbringers of darkness—thy Trojan gladiators shall attack donning the garbs of twilight. Foretold were warriors with crowns black as the witching hour, exacting their fury upon the Pacific Dozen. Thou hast been deceived! The overseer of sport, Patrick Haden taunted us in his prancing pagan dance von Harlem. ‘Twas but a ruse. Seriously though. Should there be change? And if so, how much? (Sorry to phrase it like a question on an AP test). Remember the whole black sock fiasco? When Lane Kiffin first became head coach at USC, there was some controversy over Ronald Johnson’s black socks. That might’ve been a bit too particular and picky. 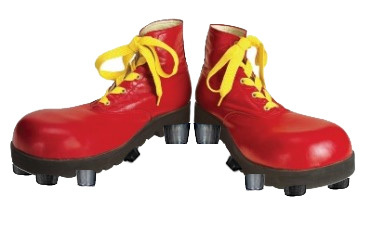 Maybe if Ronald Johnson had left the locker room wearing Ronald McDonald cleats, it will have gone too far. After Pete Carroll changed from stripes back to chevrons in the early 2000s, the uniforms did not budge for a decade. Come 2012, with all the preseason hype, USC saw the introduction of cardinal and gold gloves and cleats. Chrome helmets followed about two years later, which seemed fairly well-received. I can’t say for sure though, since I didn’t even bother to conduct a straw poll. The good thing is that they weren’t used every game. In a case like that, it would seem everybody wins. The recruits, players and fans get something new; it doesn’t stray too far from what Trojan fans are accustomed to; and the number of jimmies rustled was low. Back to the debate…since I can’t help but inject my opinion everywhere, I’ll tell you mine. They should be able to tweak a little bit here and there. Maybe trot out one alternate for a single game every few seasons. Nothing too crazy. Some 17-23 year old that will be around for 1-5 years shouldn’t get to drastically alter the tradition of a 126 year old program. That’s not to say they shouldn’t get input.